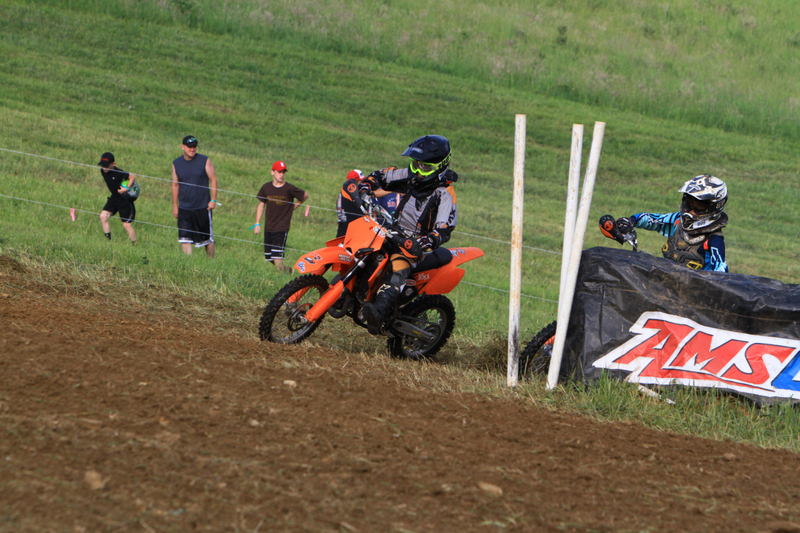 In 2009 I started halfway through the NCHSA season racing on a 7-year-old, 65cc bike. We propped it up on a milk crate to work on it. I finished 8th in my first race and I was hooked. Then, halfway through my first full season, we realized I needed more bike if I was going to win. So, in 2010, we bought a 2008 65cc bike and I was beginning to win races at the end of that season. The next season (2011) I won the points championship for my class on my 2008 bike. In 2012 I moved up a class and stayed on my 2008 bike. Near the end of 2012, we bought a 2007 model 85cc bike and I moved up another class. This past year (2013) I won the NCHSA points championship – on a six-year-old bike. The reason I told you the story above is so that you would know I don’t need the newest equipment to be happy and win. I still plan to race my 2007 model in 2014. I also want you to know that my dad and I work hard to take care of the bike that we’ve got. My family has made it possible for me to race for the past four years and we’re proud to have won a couple of NCHSA points championships, and even a top 5 GNCC finish on a budget that’s pretty small compared to many of my competitors. My family will be helping again this year, but the distances (and fuel costs) to the GNCC races are greater and the competition is a little more fierce. I know I can win on my ’07 bike, but I’ll need a few extra things, like an oversized tank and a suspension update. If you are interested in joining me on my journey this year by becoming a sponsor, then I’ll be very happy, very grateful and more than willing to represent you, or your company, or your cause in any way I can. Some suggested sponsorship offers are presented below or, to discuss the options further, please contact us. Bronze Sponsorship $25: Your name or company name (text only) will be listed as a sponsor on the tailgate of my 6′ x 12′ enclosed race trailer. You will be listed on my website as a sponsor.You will also be included on the email newsletter list so that you can follow our progress during the season! Silver Sponsorship $50: I will reserve a 6 inch x 6 inch area on the tailgate of our race trailer and prepare a decal for your name, company name, logo, photo, or about anything else you would like to publish there (within reason). We hope to be traveling about 10,000 miles this summer, so there should be plenty of chances for it to be seen! You will be listed on our website as a sponsor. You will also be included on the email newsletter list so that you can follow our progress during the season! Gold Sponsorship $100: I will reserve a 12″ x 12″ area on either the left or right side of our race trailer and prepare a decal for your name, company, logo, photo, or about anything else you would like to publish there (within reason). We hope to be traveling about 10,000 miles this summer, so there will be plenty of chances for it to be seen! You will be listed on our website as a sponsor.You will also be included on the email newsletter list so that you can follow our progress during the season! Platinum Sponsorship: $500: You will become a principal sponsor. You will receive a 12 inch x 24 inch area on both sides of my race trailer. I will provide decals containing any design you request (within reason). You will be listed as a sponsor on the bike decals. I will mention you as a sponsor on any podium appearances and in any interviews I may give. You will also be listed on my racing home page as a main sponsor. You will also be included on the email newsletter so that you can follow our progress during the season!